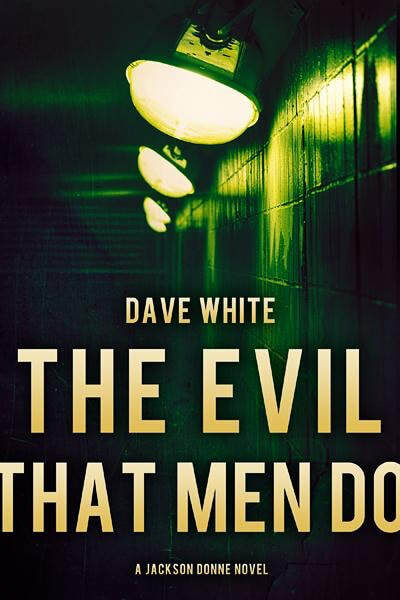 Nominated for the prestigious Shamus Award, THE EVIL THAT MEN DO is the second novel in Dave White’s critically acclaimed Jackson Donne series. Even generations later, you can’t escape. . . the evil that men do. Stripped of his private investigator’s license and slumming it as a night security guard at a Jersey storage facility, Jackson Donne thinks he’s finally hit rock bottom. Then the bottom really falls out: The sister he hasn’t seen in years shows up, needing help. Turns out Donne’s Alzheimer’s-stricken mother has begun hinting at long-buried family secrets from her hospital bed, suggesting a sinister–even murderous–past. Meanwhile, Donne’s relatives are suddenly being greeted by blackmail, car bombs, and bullets to the back of the skull. All Donne wants is to disappear–preferably into a nice frosty pint glass–but he soon realizes that his only chance at saving his family, and himself, is by solving a mystery more than sixty years old. Now he needs to figure out how a hit man, crooked cops, corrupt politics, a kidnapping, and the city of Bayonne all fit together. He’ll discover that old family secrets still have the power to kill in this razor-sharp PI story that makes classic noir new again.